The Sara 5.59 ft. Centre Drain Soaking Tub in White is inspired by the angular design of industrial architecture, but softened with modern materials. Becoming more spacious as the water level rises, it is simple, symmetrical, elegant, striking. Contemporary styling and clean lines contribute to the freestanding bathtub's refined look, sure to enrich your bathroom ambience and add a hint of serenity. This unit includes a floor-mounted single-handled chrome faucet along with overflow and drain outlets in chrome for a polished look. The acrylic construction is strong, light and warmer to the touch than typical enamel or steel tubs, allowing for easy installs and heat-retaining soaks. The Hannah 4.92 ft. Back Drain Soaking Tub in White is inspired by the hard edges and lines of modern architecture. Clean and geometric, the asymmetrical shape lends a beautiful minimalist, yet updated, feel to the modern bathroom. Contemporary styling and crisp angles contribute to the freestanding bathtub's refined look, sure to enrich your powder room ambience and add a hint of sophistication. This unit includes a floor-mounted single-handled chrome faucet along with overflow and drain outlets in chrome for a polished look. The acrylic construction is strong, light and warmer to the touch than typical enamel or steel tubs, allowing for easy installs and heat-retaining soaks. The Hannah 5.59 ft. Back Drain Soaking Tub in White is inspired by the hard edges and lines of modern architecture. Clean and geometric, the asymmetrical shape lends a beautiful minimalist, yet updated, feel to the modern bathroom. Contemporary styling and crisp angles contribute to the freestanding bathtub's refined look, sure to enrich your powder room ambience and add a hint of sophistication. The acrylic construction is strong, light and warmer to the touch than typical enamel or steel tubs, allowing for easy installs and heat-retaining soaks. Chrome-finished overflow and drain outlets are included for a polished look. 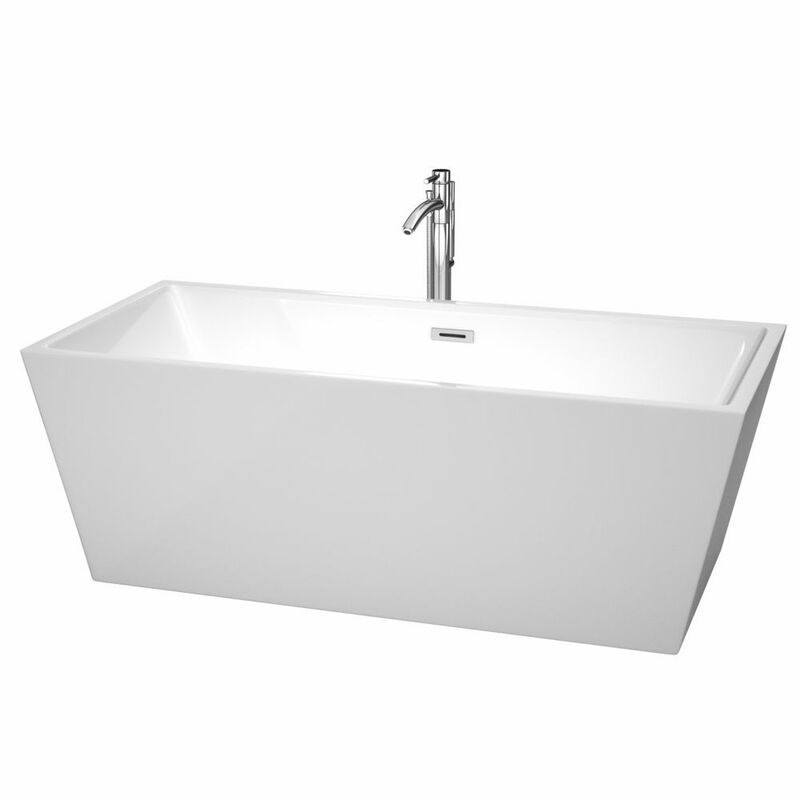 Soft, rounded design meets full-immersion soaking in the Melissa 5.92 ft. Centre Drain Soaking Tub in White. This freestanding bathtub has an oval shape with a different slope on each end to accommodate a laid-back or upright bathing position. Contemporary styling and soft lines contribute to the tub's modern aesthetic, sure to enrich your bathroom ambience and add a hint of serenity. The unit includes a floor-mounted single-handled chrome faucet along with chrome-finished overflow and drain outlets for a polished look. The acrylic construction is strong, light and warmer to the touch than typical steel or enamel tubs, allowing for easy installs and heat-retaining soaks. Deep enough for relaxing soaks yet occupying a small footprint, the Melody 5 ft. Centre Drain Soaking Tub in White is a superb choice for smaller bathrooms or confined spaces. Contemporary styling and clean lines contribute to the freestanding bathtub's modern aesthetic, sure to enrich your bathroom ambience and add a hint of serenity. This unit includes a floor-mounted single-handled brushed nickel faucet along with overflow and drain outlets in brushed nickel for a polished look. The acrylic construction is strong, light and warmer to the touch than typical steel or enamel tubs, allowing for easy installs and heat-retaining soaks. It's surrounded by a flat ledge to keep candles, oils, salts and other bath accessories nearby. Sara 67-inch Acrylic Centre Drain Soaking Tub in White with Floor Mounted Faucet in Chrome The Sara 5.59 ft. Centre Drain Soaking Tub in White is inspired by the angular design of industrial architecture, but softened with modern materials. Becoming more spacious as the water level rises, it is simple, symmetrical, elegant, striking. Contemporary styling and clean lines contribute to the freestanding bathtub's refined look, sure to enrich your bathroom ambience and add a hint of serenity. This unit includes a floor-mounted single-handled chrome faucet along with overflow and drain outlets in chrome for a polished look. The acrylic construction is strong, light and warmer to the touch than typical enamel or steel tubs, allowing for easy installs and heat-retaining soaks.